This program is supported in part by the Fulton County Board of Commissioners. Bent Frequency hosts George Lewis for a 3-day residency at Georgia State University as a Provost’s Visiting Scholar. Bent Frequency’s April 9th concert presented as part of the SoundNOW Festival in Atlanta. All events are free and open to the public. Funding for this program is provided in part by the Fulton County Board of Commissioners. Bent Frequency celebrates the Chinese New (Y)Ear! 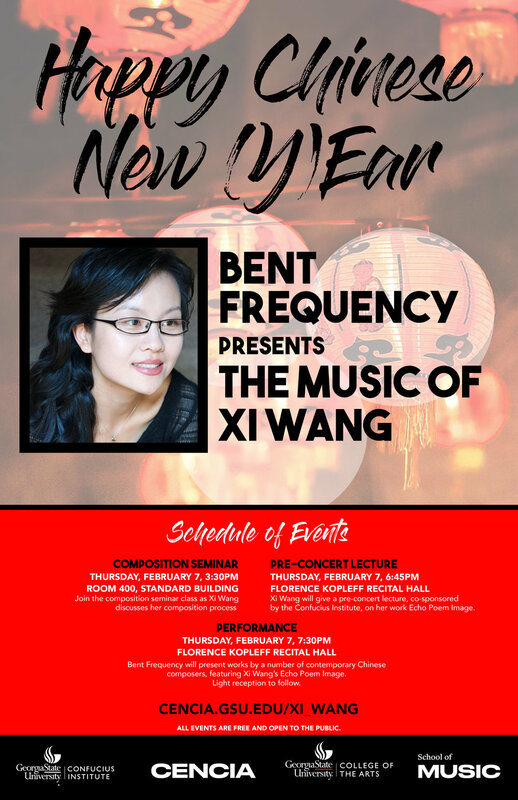 Bent Frequency presents a concert celebrating the Chinese New (Y)Ear! Bent Frequency brings composer Xi Wang to Georgia State University to celebrate the Chinese New Year This residency is presented in collaboration with CENCIA, the GSU School of Music, College of the Arts, and the GSU Confucius Institute. 6:45pm: Xi Wang will give a pre-concert lecture, co-sponsored by the Confucius Institute, on her work Echo Poem Image. 7:30pm: Bent Frequency will present works by a number of contemporary Chinese composers, featuring Xi Wang’s Echo Poem Image. Following the concert, join us for a reception, sponsored by the Confucius Institute. Sponsored by CENCIA, and the GSU Confucius Institute. 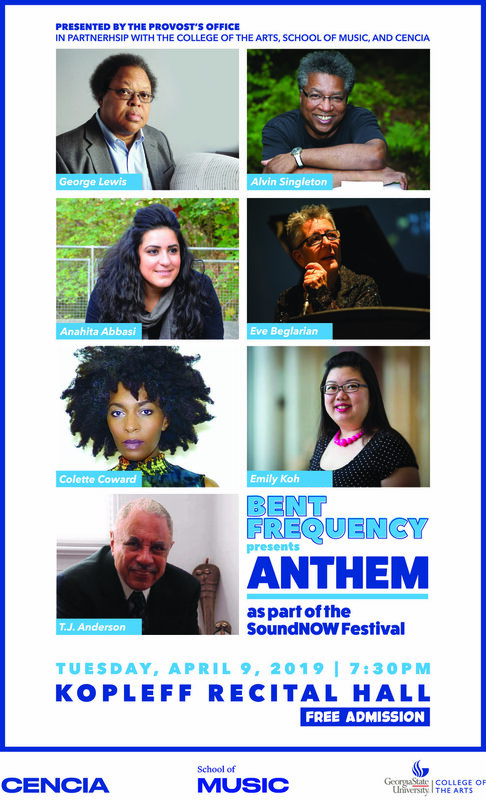 Bent Frequency’s 2018-19 series is funded in part by the Amphion Foundation, Alice M. Ditson Fund of Columbia University, and The Aaron Copland Fund for Music. Bent Frequency, Priscilla Smith Productions and Flux Projects present Phil Kline’s Unsilent Night. This is a musical concert where the whole family can participate. We’ll stroll through the historic West End neighborhood with your boomboxes and smart phones (with Bluetooth or battery-operated speakers) playing Phil Kline’s luminous soundscape, creating a beautiful experience you’ll never forget. No music experience is necessary, and people of all ages are invited to join or watch the walk. You do not have to carry a music playing device to join the stroll. We’ll gather beforehand at Gallery 992, where you can purchase a coffee or adult beverage, then “perform” as we fill the streets of the West End with the four parts of Phil Kline’s work, Unsilent Night. Our route will be a loop, bringing us back to Gallery 992. Stick around for Sunday Night Jazz beginning around 9, followed by an open jam. All events are free and open to the public. If you’re interested in performing Unsilent Night sure to REGISTER FOR THE EVENT so we’ll be prepared. Then choose your “instrument” and download the appropriate track: all details and tracks here. Everyone who wants to participate as a “musician” needs to bring speakers or amplification of some kind. + Battery-powered speakers that plug into your smartphone — using the free Unsilent Night app. Be sure to download the app using wi-fi before the event. It is too large to download via data connection. + OR you can bring a boombox powered by batteries and play a cassette tape or CD the organizers will provide. Please do not plan to play the audio on the built-in speakers of a laptop, smartphone, or tablet. These devices aren’t loud enough and the sound is distorted. Please don’t plan on streaming your track from the web; coverage may be spotty and your “performance” will suffer. Friends and family who want to walk along without speakers are welcome! You don’t have to “play” to participate, but the more “instruments” the better we’ll sound. We’ll publicize the route, so folks can look for us along the way to hear us and see us. For extra fun, bring glo-sticks, glo jewelry, small flashlights, LED tealights, glow-in-the-dark clothing. Let’s make a visual experience to go along with our audio world! Arrive at Gallery 992 by 6:30 pm on Sunday, December 16th! Bent Frequency, with special guest artist Sarah Hennies, presents a Sarah Hennies Portrait Concert. Sarah Hennies is a composer and percussionist from Ithaca, NY. Fluid Radio described her music as "a highly sophisticated and refined performance . . . that starts and ends with listening and encourages a different way of listening from its audience." She received her M.A. in percussion from UC-San Diego in 2003. She now plays with noted percussion trio Meridian and in 2016 Sarah was chosen as a fellow in music/sound from the New York Foundation for the Arts. Hennies has recorded and performed music by numerous composers and can be found on a wide variety of labels including Quakebasket, and Quiet Design and on the record label Weighter Recordings. Generous support for this program is provided by the Mayor's Office of Cultural Affairs, Georgia Council for the Arts, Amphion Foundation, Ditson Foundation, and The Center for Collaborative and International Arts (CENCIA) at GSU. Bent Frequency opens the 2018-19 season with Sarah Hennies' Contralto at the Plaza Theatre. A one-hour work for video and live chamber ensemble that combines video art, experimental music, and aspects of “voice feminization training” to explore the experiences of trans women in a “trans only” space. There will be a discussion with the composer following the performance. Generous support for this program is provided by The Atlanta Film Society, The Plaza Theatre Foundation, Mayor's Office of Cultural Affairs, Georgia Council for the Arts, Amphion Foundation, Ditson Foundation, and The Center for Collaborative and International Arts (CENCIA) at GSU. Bent Frequency, in conjunction with ANALOG Arts, the Mayor's Office of Cultural Affairs, and the GSU College of the Arts and School of Music, will present three works ( Edentia, Himmels-Tür, and Cosmic Pulses) from Karlheinz Stockhausen's final cycle of works KLANG (Sound) during the Atlanta SoundNOW Festival. KLANG consists of 21 individual pieces called "hours." Himmels-Tür (Heaven's Door), Edentia for soprano saxophone and electronics, and Cosmic Pulses for 8-channel tape represent some of the last compositions from one of the 20th and early 21st Century’s great composers. We're excited to present this concert of his not-yet-well-known works during Atlanta’s contemporary chamber music festival. Bent Frequency Co-Artistic Director Stuart Gerber worked with Stockhausen for many years. Himmels-Tür (Heaven's Door), the 4th hour from KLANG, was written for and premiered by Gerber in 2006. He has performed this work nearly 30 times all over the world (but only once in Atlanta in 2008). Edentia, for soprano saxophone and electronics, is the 20th hour from KLANG. Stockhausen uses a few layers of electronic sounds from Cosmic Pulses as the background track for Edentia. In the 1970s Stockhausen became interested in the mystical Urantia book. Edentia is a planet mentioned in the Urantia Book: "There is harmony of music and euphony of expression in the orations of Edentia which are inspiring beyond description." Cosmic Pulses (2007), the 13th hour, is Stockhausen's final purely electronic piece. Stockhausen was an early proponent of electronic music in the 1950s and helped to develop many of the techniques still used today. Cosmic Pulses is designed for an 8-channel sound system that envelops the audience. It is difficult to program this piece as most venues do not have access to an 8-channel system. Fortunately, Georgia State University’s Kopleff Recital Hall has an incredible state of the art system. Cosmic Pulses is complex and therefore difficult to mix live. BF will be collaborating with ANALOG Arts to bring the New York-based musician Joe Drew to mix sound for this performance. Joe has had extensive experience with Cosmic Pulses, and presented the US premiere as well as multiple performances in New York, Philadelphia and across the country. Cosmic Pulses has been presented to great critical acclaim all over the world. Critics have said the following of the piece: “incessant and implacable, like magnified wave crashes, cheerfully apocalyptic." "Thrilling: it felt as if Stockhausen had dropped a microphone into deepest space." We're thrilled to be presenting the Atlanta premiere of this final electronic piece from a pioneer of electronic music. We hope you'll join us. This program is supported in part by the Mayor's Office of Cultural Affairs, Fulton County Board of Commissioners, Analog Arts, and Georgia State University College of the Arts and School of Music. Bent Frequency presents: Lines, Broken. Featuring music by John Cage, selections from Michael Pisaro's large-scale vocal cycle Tombstones, and the southeastern premieres of newly commissioned works by Elainie Lillios and John Liberatore. $10 / $7 students–cash at the door. This is a musical concert where the whole family can participate. We’ll stroll through the historic West End neighborhood with your boomboxes and smart phones (with Bluetooth or battery-operated speakers) playing Phil Kline’s luminous soundscape, creating a beautiful experience you’ll never forget. We’ll start and end at Monday Night Brewing’s Garage, walking for 45 minutes--the length of the composition--in a loop through the neighborhood, finishing where we started. Make sure to FILL OUT THE REGISTRATION FORM so we’ll be prepared. We hope you and you family will join us for an evening of soundscape and fellowship. SHARE THIS WITH EVERYONE YOU KNOW! LET'S FILL THE WEST END WITH BEAUTIFUL SOUNDS! Over the past quarter century, Unsilent Night has become an international phenomenon, taking place in more than 100 cities, big and small, across 5 continents—from New York to San Francisco, and Brussels to Saskatoon. Unsilent Night is an original composition by Phil Kline, written specifically to be heard outdoors in the month of December, always as a free event. It takes the form of a street promenade in which the audience becomes the performer. Originally the music was played using only cassette tapes in portable stereos, but as vintage boomboxes have become harder to find, more people use smartphones with portable speakers by downloading the free Unsilent Night app which randomly selects one of four tracks to play. Together, all four tracks comprise Unsilent Night. Participants start their devices simultaneously, then walk a carefully chosen route through the city’s streets, creating a unique mobile sound sculpture that is different from every listener’s perspective. Lauded in the New York Times for her “admirable fluidity,” soprano Amy Petrongelli revels in singing music of all different periods and styles. It is 2017. We are a nation polarized, a society reeling. In times like these it's the artists' duty to interpret, to comment upon, to draw attention to, and even to resist injustices and inequalities. Bent Frequency presents a program of works by artists determined to explore the difficult topics of modern injustice and advocate for equality, peace, and love through commentary, satire, and reflection. The works in this program invite the listener to think anew on our common humanity and uncommon times. With love, we resist! The Fall of the Empire–The empires and dynasties of human history have fallen, not so much by the hands of outside conquerors, but rather have crumbled from within. The collection of texts assembled by Rzewski into a kind of play or monodrama—variously individual “snapshots” isolated in time and place, but connected and connectable—are yet another retelling of that story. Presidential Address - for soprano voice and piano, recontextualizes the words of Donald Trump, as heard in the "locker room." R.I.P.T addresses the epidemic of gun violence and murder of young black men, as poignantly captured in the new tradition of creating memorial T-shirts with the pictures of the murdered men's faces. The music draws its source material from "Beef" by L’il Reese, L’il Durk, and Fredo Santana. "Beef" was the song playing when David Dunn murdered Jordan Russell Davis, in an altercation that began because Dunn felt the music was playing too loudly in the SUV Davis was riding in. The lyrics of My Feelings Now are adapted from various things the Indonesian dancer and choreographer Hartati said during a residency in Los Angeles with Eve in the summer of 1996. I will learn to love a person is a piece about relationships—personal, romantic, harmonic, and timbral. Like all of his music, it obsessively controls its limited musical materials in service of big emotional catharses. Its protagonist is a precocious observer of the world and other people, but also immature and wildly heartbroken; the process of the piece is the discovery that there is, of course, no set of rules that govern human relationships. Bent Frequency's 2017-18 season supported in part by the Alice M. Ditson Fund of Columbia University and Amphion Foundation. Funding for this program is provided by the Fulton County Board of Commissioners. If you need reasonable modifications due to a disability, including communications in an alternate format, in order to participate in any County-sponsored program or meeting, please contact Bent Frequency at 404-981-3023 or info.bentfrequency@gmail.com, seven (7) days in advance to facilitate your request. For TDD/TTY or Georgia Relay Service Access, dial 711. To obtain this information in an accessible format, please call (404) 981-3023. Bent Frequency Duo Project is headed on tour! We are thrilled to be premiering new works for saxophone and percussion by Elainie Lilliios (supported by the Barlow Commissioning Fund), John Liberatore, and Zack Browning. We will be presenting masterclasses, composer reading sessions, and composer/performer discussions in addition to our performances. We would love to see you at a show! Bent Frequency released our debut album "Diamorpha" on Centaur Records! To celebrate, we are giving a CD Release Party Concert at Kavarna on Saturday, August 19th at 8:30pm. Bring your thirsty, music loving friends and Get Bent! Tickets are $10 at the door or $15 for door and CD! Diamorpha features the Bent Frequency Duo Project, Jan Berry Baker, saxophone and Stuart Gerber, percussion. Jan and Stuart have commissioned over 20 new works for their duo in the past 5 years and have given countless performances across the US, Europe, and Mexico featuring these works. Diamorpha features pieces written by Devin Maxwell, Christopher Burns, Amy Williams, Jeff Herriott, Amelia Kaplan, and Robert Scott Thompson. Cover art by Craig Dongoski. 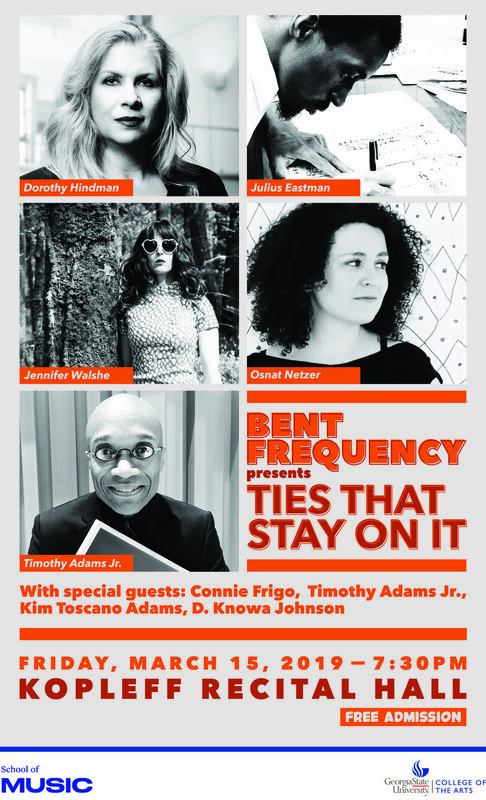 Bent Frequency's 2017-18 season supported in part by the Alice M. Ditson Fund of Columbia University and the Amphion Foundation. Bent Frequency, in partnership with the Rialto Center for the Arts and Georgia State University’s College of the Arts and School of Music, presents A Residency with John Luther Adams, April 7-9, 2017. These concerts of music by the internationally renowned, Pulitzer Prize winning composer coincide with the 2017 SoundNOW Contemporary Music Festival. Woodruff Park in downtown ATL - FREE! Sila: The Breath of the World is a large-scale work featuring 80 musicians, intended to be performed outdoors in order to explore the acoustic qualities of a given environment. In this performance, a Southeastern premiere, 80 voice, woodwind, brass, string, and percussion students from the GSU School of Music perform within the urban soundscape of the city streets of downtown Atlanta in and around Woodruff Park. Kopleff Recital Hall - FREE! Lecture by John Luther Adams on his music, writings, and aesthetics. This concert features solo and chamber music by John Luther Adams, performed by GSU School of Music students. The centerpiece of this concert is Adams’ songbirdsongs of 1974. The John Luther Adams Residency culminates with a retrospective concert of his music performed by Bent Frequency, preceded by a pre-concert talk with John Luther Adams in the Rialto Lobby at 2:00. This program includes, among other works, Strange Birds Passing (1983), Red Arc/Blue Veil (2002), Make Prayers to the Raven (1996) and Qilyaun (1998). These programs are supported in part by the Mayor’s Office of Cultural Affairs, the Center for Collaborative and International Arts (CENCIA) at Georgia State University, the Rialto Center for the Arts, and the Georgia State University School of Music. With support from a Willson Center Public Impact grant, the University of Georgia presents Bent Frequency and guests Allen Otte and John Lane in "The Innocents Project" residency from February 14-16, 2017. Together with UGA's schools of art, law, music, ICE, and the Georgia Innocence Project organization, the residency will shine a light on social justice, civil and human rights, and art’s role in advocating for them. Join us for this conversation featuring Atlanta-based contemporary chamber ensemble Bent Frequency and guest artists Professor Allen Otte and Dr. John Lane as they discuss the collaborative and cross-disciplinary aspects of their performance project The Innocents, inspired by the photo exhibit of The Innocence Project by photographer Taryn Simon, which examines the issue of wrongful conviction in the American penal system. Simon traveled across the US photographing and interviewing individuals who had been wrongly convicted and served time for crimes they did not commit. The individuals photographed were exonerated through DNA evidence. Their performance of The Innocents takes place in the Dodd Atrium (first floor of Lamar Dodd Building) the following evening, 2/16, at 6pm. Sponsored by a Willson Center Public Impact Grant. "Collaboration and Community: Cultivating a Performative Voice"
Join us for this conversation featuring Atlanta-based contemporary chamber ensemble Bent Frequency and guest artists Professor Allen Otte and Dr. John Lane as they discuss how their work as contemporary musicians has broadened into culturally and socially relevant interdisciplinary performance projects that inspire artistic development and purpose beyond the playing of their instruments. Join us for this distinguished panel discussion, moderated by law professor Russell Gabriel, that features: Interim Director of the Georgia Innocence Project, Clare Gilbert; Georgia Innocence Project’s first exoneree, Clarence Harrison; Ryan Swingle, Regional Capital Defender; and guest artists Professor Allen Otte and Dr. John Lane. This panel will discuss aspects of the death penalty, the process of exoneration and how social justice can inspire art and music. The first half of the concert features "The Innocents" work by Dr. John Lane. Through the use of non-traditional instruments, such as found or street percussion (rocks, pots, pans, trash cans, etc...), and the use of electronics, the music and text illustrate some of the strong and complex emotions brought about by Simon's original exhibit. The second half features Bent Frequency performing "Coming Together" (1971) and "Attica (1972), by the American composer Frederic Rzewski. The text is taken from letters written by Samuel Melville, an activist and inmate killed in the prison riot at Attica State Prison in 1971. Melville’s words outline the inhumane living conditions at Attica, which lead directly to the 4-day riot that left 39 people dead. Georgia State University, Kopleff Recital Hall, 10 Peachtree Center Ave.
John Cage is one of the most influential composers and musical thinkers of the 20th century. In the 1950s, he was introduced to Buddhism and became interested in the aesthetic and artistic implications of Zen. This led Cage to incorporate Zen thinking into his creative work, including musical compositions, visual art, and performance art. During a tour of Japan, Cage visited the dry rock garden at the Buddhist temple Ryoan-Ji in Kyoto. Renowned for its serenity, austerity, and simplicity of materials, the garden inspired Cage to write the unique microtonal musical work Ryoanji. Berlin-based sound artist, performer, and researcher Dr. Michael D. Fowler has used Cage’s unconventional approach as a jumping off point for his own soundscape work. In his book Sound Worlds of Japanese Gardens (Cultural and Media Studies, 2014), Fowler documented how he used his research of Japanese gardens to create large-scale sound installations and liver performances in venues throughout Japan, China, Australia, and Germany. Bent Frequency and Fowler will collaborate on a new, Atlanta-specific concert based on one of the works discussed in Fowler’s book, Sesshutei as Spatial Model. The concert will consist of a sonic foundation of field recordings collected in Japanese gardens in Yamaguchi overlaid with a live soundscape traditional Zen instruments (rin, singing bowls, and wood blocks) with Western instruments such as saxophone, viola, trombone, voice, piano, and percussion. Additional video components and live performers will create a unique immersive performance environment in which austerity and starkness of original space is respected but re-imagined for a concert hall. In addition to Sesshutei as Spatial Model, two other musical works inspired by Japanese gardens will be performed: Japanese Garden, Hosokawa’s Vertical Time Study 2, and of course Cage’s Ryoanji. Michael Fowler - LECTURE - Georgia State University, College of Arts and Sciences Event Center, 25 Park Place, room 223. Bent Frequency and Fowler will collaborate on a new, Atlanta-specific concert based on one of the works discussed in Fowler’s book, Sesshutei as Spatial Model. 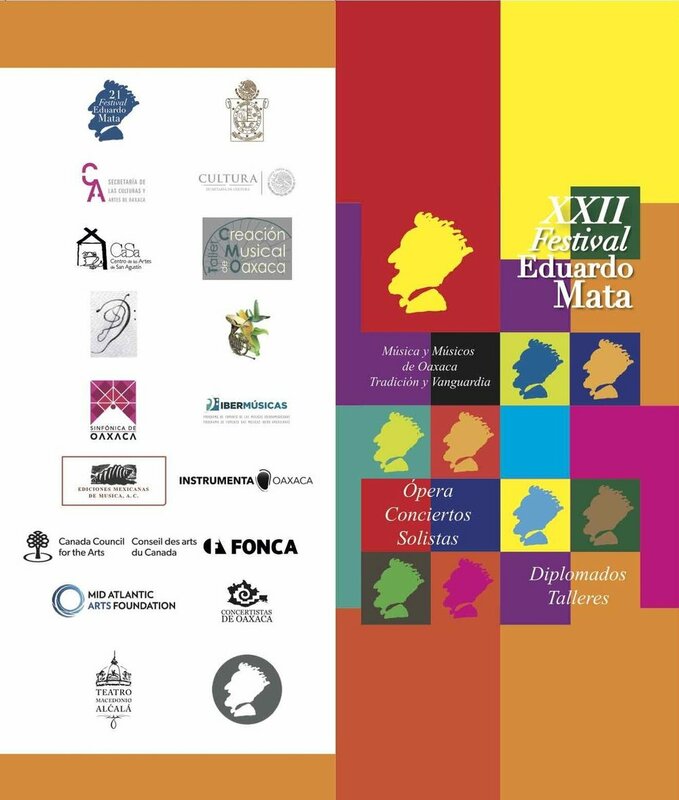 Bent Frequency will be presenting two concerts at the Eduardo Mata Festival in Oaxaca, Mexico. We've been asked to collaborate on two joint programs with the fabulous Duo Damiana (Molly Barth, flute and Dieter Hennings, guitar) for this international festival. We will be presenting music by Juan Trigos, Ricardo Zohn Muldoon, Toru Takemitsu, Karlheinz Stockhausen, Amy Williams, and many others. Bent Frequency is seeking Atlanta-area creative musicians for a unique performing experience. On Saturday 15 October 2016, Bent Frequency will present Michael Pisaro's A wave and waves, featuring guest artist Greg Stuart, during the Elevate Public Art Festival in downtown Atlanta. A wave and waves is a unique immersive experimental sound performance that requires 100 performers making small percussive sounds. Our performance will be the US premiere of this monolithic 70-minute piece. WE NEED YOUR HELP! We're looking for volunteers to perform with us! We're very excited about this project. A wave and waves is a beautiful piece, one that can only truly be experienced live. The performers are set up in a 10X10 grid with the audience interspersed within the ensemble. Don’t miss your chance to perform in the US premiere of this beautiful piece along with 99 of Atlanta's most creative musicians! We're not looking for "professional" percussionists, just serious minded and thoughtful musicians interested in sound art. You do not need to own percussion instruments to perform. If you would like to be involved, please complete the attached Google form. The deadline to apply is October 1. We hope you will join us. Funding for this program is provided by the Fulton County Board of Commissioners and the City of Atlanta Mayor's Office of Cultural Affairs. If you need reasonable modifications due to a disability, including communications in an alternate format, in order to participate in any County-sponsored program or meeting, please contact Bent Frequency at info.bentfrequency@gmail.com, seven (7) days in advance to facilitate your request. For TDD/TTY or Georgia Relay Service Access, dial 711. Experience the closing weekend of Iris van Herpen: Transforming Fashion through dance and music as CORE Performance Company and the BF Duo Project interprets van Herpen's body of work and celebrates the designer—herself a former dancer—known for her willingness to experiment. Join the BF Duo Project at the Museum of Contemporary Art for an exciting program featuring world premieres by Lowell Fuchs, Olivia Kieffer, and Adam Scott Neal. BF Duo Project is headed on tour! We would love to see you if you are in the area. DeCachetitoRaspado (Cheek to Stubbled Cheek), a Comic-Hemofiction opera created by two extraordinary Mexican artists: Juan Trigos, composer and conductor; and Juan Trigos Synister, novelist, playwright and librettist. Through their works, both artists engage with culturally relevant and significant social themes, such as absence, alcohol and drug abuse, and women’s roles in the household and in society, opening a door to their conscience, urging us to reflect and to peek into the depths of our own. The story: During their sterile matrimony and their attempt to escape it through continual drunkenness, Primancianita and Juansorisa give birth to two imaginary sons. These children become absent spectators and create a kind of fictional theater. Featured in the production are: composer and conductor Juan Trigos; stage director Luis Martín Solís: painter and scenographer Luciano Trigos; mezzo-soprano Amy Sheffer; baritone César Torruella; soprano Daniela D’Ingiullo; tenor Esteban Cordero; co-choreographers, actresses and dancers Daniela Arroio and Anna Mariscal; the Zeitgeist Chorus directed by Deanna Joseph; and Bent Frequency. Funding for this program is provided by Fondo Nacional para la Cultura y las Artes, the Fulton County Arts Council, the City of Atlanta Office of Cultural Affairs, Georgia State University Center for Collaborative and International Arts, and the Georgia State University School of Music. Join the Bent Frequency Duo Project for a free lunchtime concert at the Rialto Center for the Arts. The Duo will be performing some of works they have recently commissioned. Percussionist Stuart Gerber and saxophonist Jan Berry Baker are The BF Duo Project. Stuart and Jan have commissioned 16 new works for their duo since the 2013/14 season. In addition to performing in Atlanta, they have toured the Northeast, Midwest, Southeast and have been guest ensemble in residence at Sam Houston State University in Texas and at Tage aktueller musik festival in Nuremberg, Germany. This season they will perform in Colorado, North and South Carolina, New York, Pennsylvania, France and Germany. Composers of these new works include Robert Scott Thompson, Chris Burns, Devin Maxwell, Jeff Herriott, Roshanne Etezady, Vivienne Olive, Stefano Pierini, Kevin Schlei, Chris Arrell, Amelia Kaplan, Amy Williams, Dorothy Hindman, Paul Elwood, Lowell Fuchs, Mark Engebretson, and Laurent Durupt. Stuart and Jan will also be recording an album featuring a number of these works. “Music for a Captive Audience” turns the newest downtown feature, The Atlanta Streetcar, into Atlanta’s first mobile performance venue! For 14 hours during Elevate 2015, musicians from Atlanta’s premiere contemporary music ensemble Bent Frequency will occupy the street car to give free concerts to all riders for the duration of the loop route. These Streetcar performances will feature 12 musicians performing in various combinations of solos, duos, trios, and quartets. Visitors, concertgoers and adventure seekers will experience a unique sonic landscape while discovering what makes Atlanta unique, culturally and historically. Bent Frequency (BF) will present a performance of musical works featuring bicycles, including the Atlanta premiere of Mauricio Kagel’s Eine Brise (A Breeze) for 111 cyclists, a new work entitled The Pied Piper of the Ether written specifically for this project by Atlanta performer and composer Klimchak and the US premiere of Matthias Kaul’s Wheeled. You must have your own bicycle, helmet and a horn or bell to participate. Please click on the link below to sign up. Anyone between the ages of 12-18 may participate with a parent’s approval. Be a part of Art on the BeltLine and performing with us! Sign up today. Bent Frequency is a not-for-profit, 501(c)(3) organization.